Total weight of set: 300 lbs. We recommend you get two of each size weight plate, and if you need more, keep adding 45lb plates. The exception is the 5lb plates. Start with 4 of those. This is because of the large jump between 10lb and 25lb, creating a weight gap at some point that you won’t be able to fill without some extra 5lb weights. Total weight of set: 230 lbs. If you’re just getting into lifting, the economy bar may be fine. It’s included in most of our 300lb weight sets. 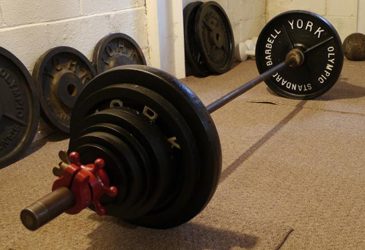 If you want something stronger and nicer to use, or if you’re doing cleans or snatches (in which case you NEED a good bar), read this article for a couple suggestions. Our basic spring clip collars are included with most 300lb weight sets. They work. The Muscle Clamp collars are hands-down the easiest to use. They’re a good choice if you find using collars at all a chore and don’t want to waste time. If you’re doing deadlifts, get the basic Lock Jaw collars. 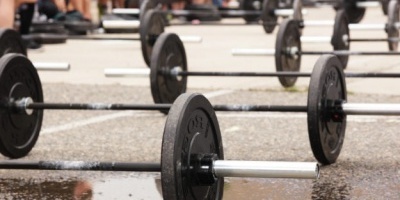 They are stronger than the above and will help keep your plates from sliding after each rep. If you’re doing cleans or snatches, get the Lock Jaw Pro collars. The plates will only slide a little bit after several drops, making these collars good for high-rep work. For the ultimate hold, get the Lock Jaw Elite collars. They are just a few bucks more, and while they do take more effort to tighten, they won’t allow hardly any movement. Excellent guide. An Olympic barbell set, a power rack and weight bench is all we need to have complete strength training at home. I have my home gym for years and I love it. I would never go back to my local gym.